When I order vegetarian fare in an Indian restaurant that is known for its North Indian fare, I usually look for an okra main course dish in the menu card. 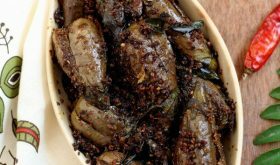 I heart bhindi and look for a new way to cook it away from the monotonous dry saute, sabji, stir fry, stew and stuffed bhindi style recipes. I always, always have okra in the refrigerator and is a must buy on every visit to the farmer’s market. I chose tender and slender looking bhindi with no blemishes. I decided on making Punjabi Bhindi Masala to go with phulkas. Seriously, this recipe is a celebration of okra. A flavor packed bhindi dish where the spices bring out the sweetness of the okra while the dry mango powder lends a slight tangy touch. 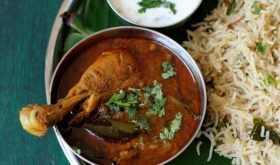 Do not allow the bhindi to get mushy, it should hold shape yet soft on bite. Delectable flavor with soft texture, and a wonderful change from the usual okra. Heat 1/2 tbsp oil in a cooking vessel, add the okra/bhindi and saute on low to medium flame for 8 mts. Remove from the vessel and keep aside. In the same vessel, add the remaining oil. Once hot, add cumin seeds and allow them to splutter. Add chopped onions and green chili paste and saute for 4 mts. Add ginger garlic paste and saute for 3 mts. Add red chili powder, turmeric powder, coriander powder, amchur powder and kasuri methi and mix. Add chopped tomatoes and saute for 6-7 mts on low to medium flame with lid. Add the okra and mix well. Cook without lid for 10 mts. Add salt to taste and garam masala powder and mix. Turn off heat. Remove onto a serving bowl and garnish with coriander leaves. 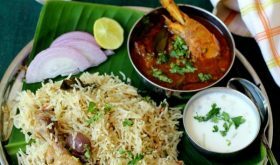 Kasuri Methi is an optional ingredient. You can add 1/4 tsp of Kitchen King Masala for a slight variation in flavor. Ensure you wash and dry the okra before chopping it. Do not place lid while cooking bhindi. 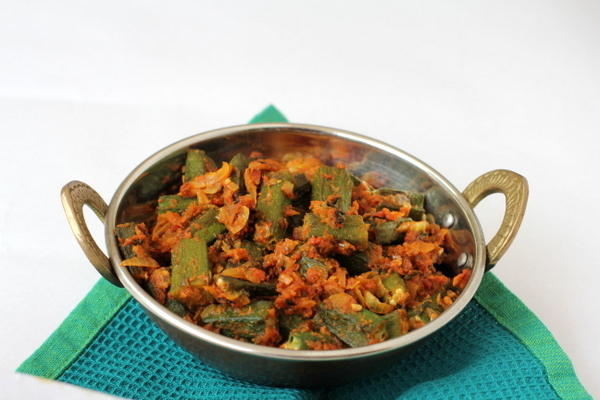 By Sailu Published: July 18, 2012 Punjabi Bhindi Masala recipe is a celebration of okra. 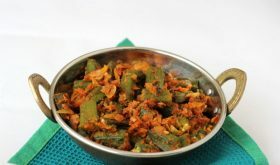 A flavor packed bhindi dish where the spices bring out the sweetness of the okra while the dry mango powder lends a slight tangy touch. one question. 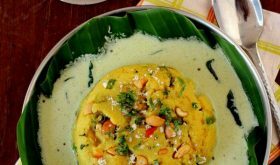 Why do you add all masalas first when cooking a north indian dish and then add veggie? would love to know if there is any health benefit. Tried this today, came out well. Thanks! Wonderful flavour. First Bhindi recipe I loved without wanting to change anything. My friend is pure vegan and she was delighted with how tasty this turned out. Very nice okra recipe, better than the few I tried so far. 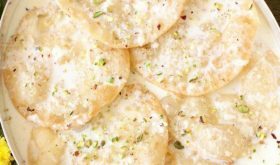 I very much appreciate your whole website as well Sailu, it has so much more recipes than the average cookbook. I just tried this recipe of yours. I loved the way it has come out. Thank you for the wonderful recipe! 🙂 attaching a pic of how it has come out. Thanks a lot. very pleased. Great recipe – my kids loved it too! Tried this recipe, loved it ! easy and simple to make too ! Cannot cook veg to save my life but this site has put an end to that to a large extent. Thank you for sharing so generously. May your hands be blessed and your mind stay as creative! Awesome, just stimbled here and make this veg. the taste was like that of the punjabi dabba! Thanks. This is a great recipe. I would recommend adding some ghee at the end to round out the flavor and reduce the acidity. If using canned Tomatoess the flavor is a little too concentrated and the butter helps with that and brings the focus back to the okra. Other than that, make as directed.